I also have a YouTube channel with several videos of tunes played by experienced players. Please see the audio files page for details. In addition to feedback listed on the "Customers Comments" page on the sidebar, I received this unsolicited feedback, April, 2010. ""Excellent flute! Cheerful and professional customer service! I'd recommend this to any other beginner like myself who isn't sure if they want to put $300 down for a "true" Irish flute without trying it out for 1/3 the cost. I'm progressing rapidly on Doug's flute, and I'm glad I got it. Doug handled my order speedily and professionally -- and when I lost my tipple-fajardo wedge, he installed a replacement wedge for me at no charge! Good busineeses like this deserve our praise. Way to go Doug!" On the online flute forums my flutes are sometimes mentioned as "starter flutes", suggesting that a player would ideally want a "better" flute as he/she progressed on the flute. However, I often receive email feedback from customers like the one I received today, September, 2010. Speaking of his purchase of my 3-piece, 6-hole low D flute with the lip plate headjoint, he wrote: "I paid five and a half and a half times what your flute and extra head cost me - for a higher maintenance wooden flute that doesn't give me the satisfaction, playability and enjoyment I get from yours. Yours is even easier to half hole." The photo on top is of my 3-piece, 6-hole low D flute with inline finger holes and an oval embouchure hole with brushed silver vinyl faux rings. It is my most popular flute. 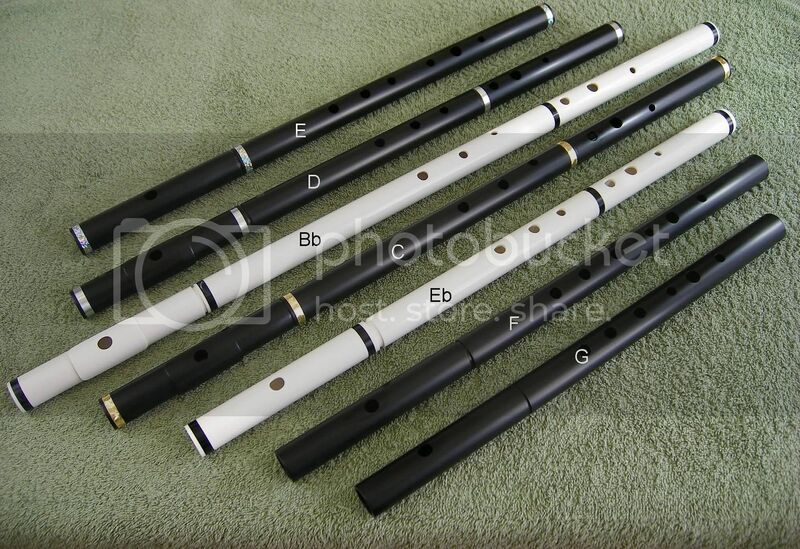 The photo on the bottom is a group photo of most of the flutes that I am offering below. Both photos can be made larger by clicking on them. The following flutes are arranged in order from the smallest size (highest pitch) to the largest size (lowest pitch). Optional lip plates (+$25). I now consider the Tipple-Fajardo headjoint wedge as an integral part of the flute, so the price of the flute includes the installed wedge. Please see the page "Sorting Out the Options" on the sidebar. Four-piece flutes have an extra joint between the 5th and 6th finger holes to allow adjustment of the 6th finger hole. The above descriptions of the flutes as medium size and large size are arbitrary and are merely my attempt at separating the larger-bore flutes by relative sizes. Actually, both of these flute groups are made from the same size of pipe. The pipe that I use to construct the large-bore flutes (G, F, E, Eb, D, C#/Db, C, D, and low Bb) is schedule 40, 3/4" PVC plumbing pipe, which has an ID (internal diameter) of .800" and a wall thickness of .125". For the low D flute: The 6-hole low D flute is 23 1/2" long and weighs 6.2 oz. The 8-hole low D flute is 26 1/2" long and weighs 7.2 oz. Both flutes have exactly the same finger hole placement. All flutes are available with offset or inline finger holes (please specify). Unless you have large hands, I recommend offset finger holes for the larger of the above flutes. 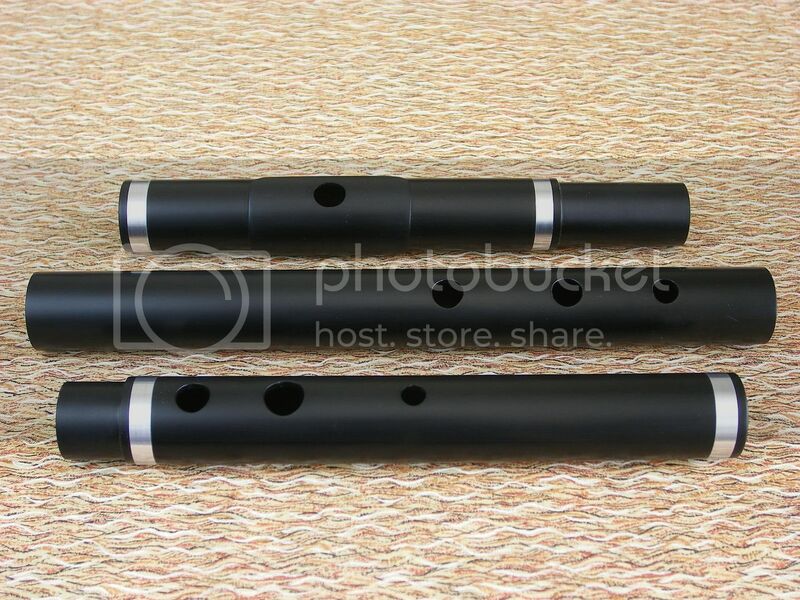 The choice between inline or offset holes also depends on how you plan to hold the flute. Inline finger holes may be a better choice with the piper's grip. Please refer to the separate page "Flute Finger Hole Comparison" for more details. Flute Colors: Please see the discussion about this and my recommendations on my FAQ page. Flute embouchure: For the first ten years of my flutemaking (over a thousand flutes) I have used one embouchure design, a smaller round embouchure hole (about 9.5 mm in diameter) for all of my flutes. Recently, however, I have been encouraged to also offer a more conventional embouchure for the modern Irish flute. Please see the separate page, "Flute Embouchure" for more details, photos, and my recommendations. Faux Rings: I will install four vinyl rings of your choice on a new flute without an additional charge. Please see the page "Dressing Up Your Flute" on the bottom of the side bar.In the USA I ship the above flutes by USPS priority mail with delivery confirmation (tracking) and insurance at a flat rate for $10 for most states and $12 for west coast destinations. Multiple flutes can be shipped together for slightly more (please inquire). I like to ship international orders by insured USPS airmail, and the shipping cost is $17 for most places in the world. For some countries I do not offer shipping insurance, although I have had very good luck with USPS shipment all over the world, including Hong Kong, Russia, South Africa, to name a few. In the USA I ship the above flutes by USPS priority mail with delivery confirmation (tracking) and insurance at a flat rate for $10 for most states and $12 for west coast destinations. Multiple flutes can be shipped together for slightly more (please inquire). I like to ship international orders by insured USPS airmail, and the shipping cost is about $20 for most places in the world. For some countries I do not offer shipping insurance, although I have had very good luck with USPS shipment all over the world, including Hong Kong, Russia, South Africa, to name a few. In the USA I accept payment by personal check or money order. To limit my participation with ebay/paypal, I am no longer listing flutes for sale on ebay or accepting paypal payment in the USA. I am sorry for any inconvenience that this may cause. For international orders I accept payment by international money orders in US dollars drawn on an USA bank, American Express, Western Union MoneyGram, or Paypal (add 4% to partially offset my paypal fee) as a last option.